The MEGGER DUCTER DLRO10 and DUCTER DLRO10X bring new standards to low resistance measurement. Both are fully automatic instruments, selecting the most suitable test current, up to 10 A dc to measure resistance from 0.1 µΩ to 2000 Ω on one of seven ranges. 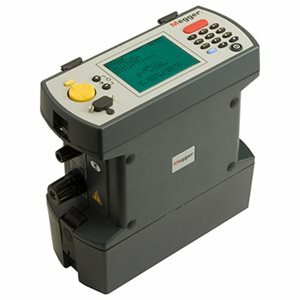 For users who desire more control over the measurement process, DLRO 10X uses a menu system controlled by a two-axis paddle to allow manual selection of the test current. DLRO10X also adds real-time download of results and on-board storage for later download to a PC. Both instruments are built into a strong, lightweight case that is equally at home in the field or in the laboratory. Light enough to be worn around the neck, they are small enough to be taken into areas which were previously too small to access. DLRO 10 uses a large, bright 4-1/2-digit LED display while DLRO 10X has a large, backlit LCD display.